The stack skull is badass! Looks pretty cool with smoke rolling out of it! Nice smoke ring. The dragon breath pig skull is a riot! So did the po boy brisket live up to your expectations? Mine was a 4 pounder loved it. Overall pretty good definitely makes the better way to eat a chuck roast. 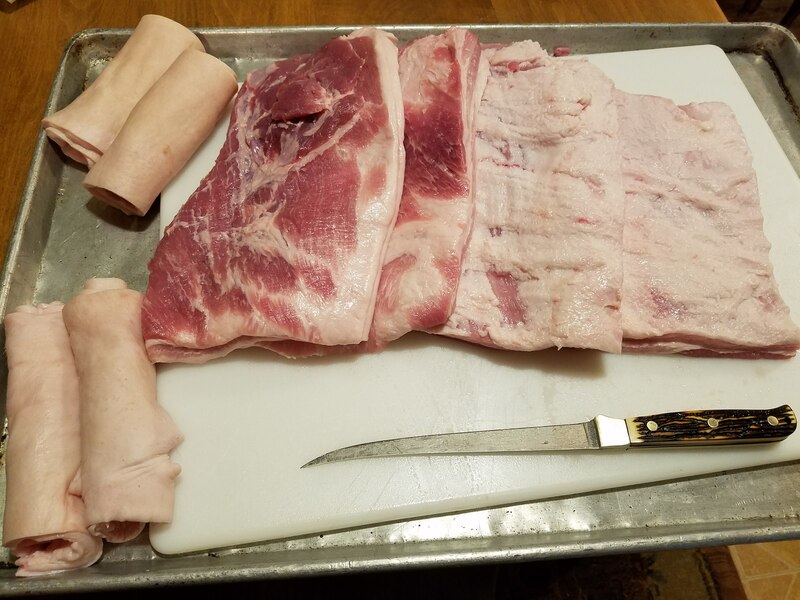 Picking up a side of pork belly tonight. 2.99 lbs skin on. It will probably be around 12 lbs give or take. Will start the curing process probably tomorrow evening. Mlodell07 is getting half of it. He is using some Cabelas Maple cure. 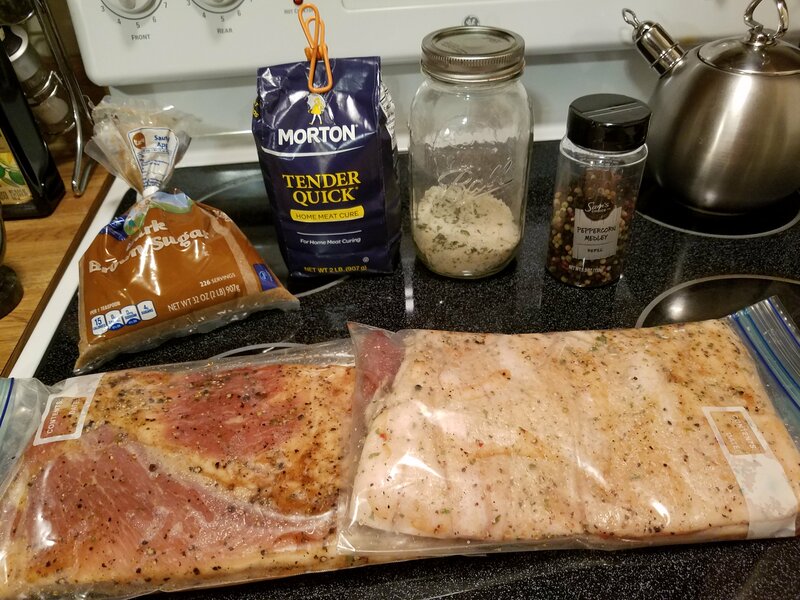 Im going to do a Mortons Tender Quick, brown sugar, black pepper cure. Picked up the belly 10.4 lbs frozen. Thaw overnight start curing tomorrow night. 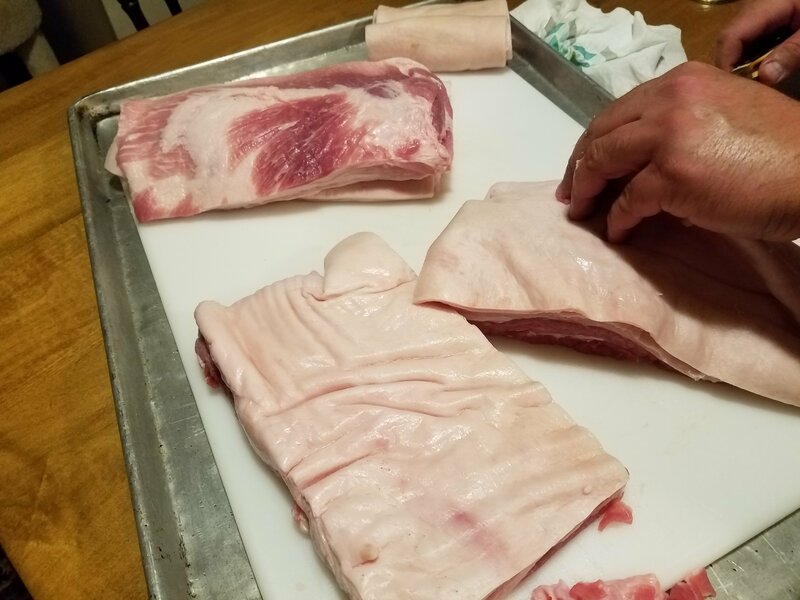 We took the skin off to save for making fatbacks /cracklings. Now to mix the cure per pound of belly. I used Morton's tender quick, homemade garlic salt, brown sugar, pepper corns. Mlodell07's used a Cabelas maple cure. So now we turn the belly once a day for seven days. See you next friday! Hurry up and wait! The bacon craze has begun. My woman looked at those 2 small pieces and said not enough! She went to pick up another whole side of pork belly to start curing today. Bacon production just went into high gear. Last edited by hawgrider; 09-15-2018 at 01:58 PM.